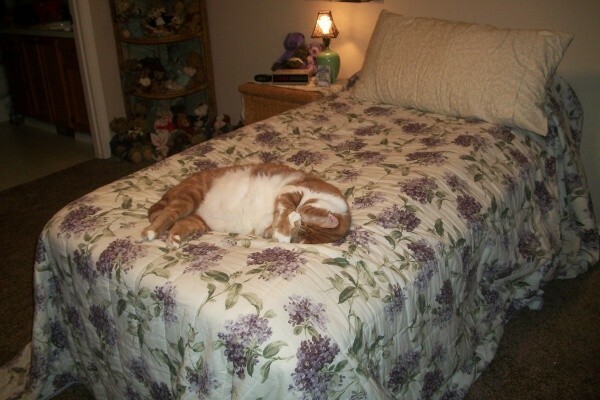 My big cat Cornelius sleeps on my bed with me. Something happened in the last three months that made him bite my foot. Now, we are not talking a little "love nibble" but a full on strike like a viper, fast and hard and painful. And, to confound me even more, it wasn't all the time. Very random. Well, I was about to give up having him in my room, or kenneling him, when I came upon the reason. His nose knew when I used a lemon based body lotion. I went to pet him the other day and his pupils dilated and he hissed and ran away. It reminded me that cats hate lemon and that every so often, I would put some on my dry feet. Now that I switched the foot cream and wore socks, which helps the foot problem, I no longer have the cat problem. I am really glad too because my big old guy is great for knowing when I need some body heat and which joint needs it. If you want to repel a cat in your flower bed, potted plants or more, put some dried lemon peel in it. You probably will never have this problem but it's nice if you do, you can remember this tip. Cats hate the smell of citrus. I place orange, lemon and lime rinds in my flower beds to keep the kittys out.